This is “Creating and Maintaining Organizational Culture”, section 15.3 from the book An Introduction to Organizational Behavior (v. 1.0). For details on it (including licensing), click here. Where do cultures come from? Understanding this question is important so that you know how they can be changed. An organization’s culture is shaped as the organization faces external and internal challenges and learns how to deal with them. When the organization’s way of doing business provides a successful adaptation to environmental challenges and ensures success, those values are retained. These values and ways of doing business are taught to new members as the way to do business.Schein, E. H. (1992). Organizational culture and leadership. San Francisco: Jossey-Bass. A company’s culture, particularly during its early years, is inevitably tied to the personality, background, and values of its founder or founders, as well as their vision for the future of the organization. This explains one reason why culture is so hard to change: It is shaped in the early days of a company’s history. When entrepreneurs establish their own businesses, the way they want to do business determines the organization’s rules, the structure set-up in the company, and the people they hire to work with them. As a case in point, some of the existing corporate values of the ice cream company Ben & Jerry’s Homemade Holdings Inc. can easily be traced to the personalities of its founders Ben Cohen and Jerry Greenfield. In 1978, the two ex-hippie high school friends opened up their first ice-cream shop in a renovated gas station in Burlington, Vermont. Their strong social convictions led them to buy only from the local farmers and devote a certain percentage of their profits to charities. The core values they instilled in their business can still be observed in the current company’s devotion to social activism and sustainability, its continuous contributions to charities, use of environmentally friendly materials, and dedication to creating jobs in low-income areas. Even though the company was acquired by Unilever PLC in 2000, the social activism component remains unchanged and Unilever has expressed its commitment to maintaining it.Kiger, P. J. (April, 2005). Corporate crunch. Workforce Management, 84, 32–38; Rubis, L., Fox, A., Pomeroy, A., Leonard, B., Shea, T. F., Moss, D., Kraft, G., & Overman, S. (2005). 50 for history. HR Magazine, 50, 13, 10–24; Smalley, S. (2007, December 3). Ben & Jerry’s bitter crunch. Newsweek, 150, 50. There are many other examples of founders’ instilling their own strongly held beliefs or personalities to the businesses they found. For example, as mentioned earlier, Microsoft’s aggressive nature is often traced back to Bill Gates and his competitiveness. According to one anecdote, his competitive nature even extends to his personal life such that one of his pastimes is to compete with his wife in solving identical jigsaw puzzles to see who can finish faster.Schlender, B. (1998, June 22). Gates’ crusade. Fortune, 137, 30–32. Similarly, Joseph Pratt, a history and management professor, notes, “There definitely is an Exxon way. This is John D. Rockefeller’s company, this is Standard Oil of New Jersey, this is the one that is most closely shaped by Rockefeller’s traditions. Their values are very clear. They are deeply embedded. They have roots in 100 years of corporate history.”Mouawad, J. (2008, November 16). Exxon doesn’t plan on ditching oil. International Herald Tribune. Retrieved November 16, 2008, from http://www.iht.com/articles/2008/11/16/business/16exxon.php. Founder values become part of the corporate culture to the degree they help the company be successful. For example, the social activism of Ben & Jerry’s was instilled in the company because founders strongly believed in these issues. However, these values probably would not be surviving three decades later if they had not helped the company in its initial stages. In the case of Ben & Jerry’s, these charitable values helped distinguish their brand from larger corporate brands and attracted a loyal customer base. Thus, by providing a competitive advantage, these values were retained as part of the corporate culture and were taught to new members as the right way to do business. Similarly, the early success of Microsoft may be attributed to its relatively aggressive corporate culture, which provided a source of competitive advantage. While founders undoubtedly exert a powerful influence over corporate cultures, the industry characteristics also play a role. Industry characteristics and demands act as a force to create similarities among organizational cultures. For example, despite some differences, many companies in the insurance and banking industries are stable and rule oriented, many companies in the high-tech industry have innovative cultures, and companies in the nonprofit industry tend to be people oriented. If the industry is one with a large number of regulatory requirements—for example, banking, health care, and nuclear power plant industries—then we might expect the presence of a large number of rules and regulations, a bureaucratic company structure, and a stable culture. Similarly, the high-tech industry requires agility, taking quick action, and low concern for rules and authority, which may create a relatively more innovative culture.Chatman, J. A., & Jehn, K. A. (1994). Assessing the relationship between industry characteristics and organizational culture: How different can you be? Academy of Management Journal, 37, 522–553; Gordon, G. G. (1991). Industry determinants of organizational culture. Academy of Management Review, 16, 396–415. The industry influence over culture is also important to know, because this shows that it may not be possible to imitate the culture of a company in a different industry, even though it may seem admirable to outsiders. As a company matures, its cultural values are refined and strengthened. The early values of a company’s culture exert influence over its future values. It is possible to think of organizational culture as an organism that protects itself from external forces. Organizational culture determines what types of people are hired by an organization and what types are left out. Moreover, once new employees are hired, the company assimilates new employees and teaches them the way things are done in the organization. We call these processes attraction-selection-attrition and onboarding processes. We will also examine the role of leaders and reward systems in shaping and maintaining an organization’s culture. It is important to remember two points: The process of culture creation is in fact more complex and less clean than the name implies. Additionally, the influence of each factor on culture creation is reciprocal. For example, just as leaders may influence what type of values the company has, the culture may also determine what types of behaviors leaders demonstrate. Organizational culture is maintained through a process known as attraction-selection-attrition. First, employees are attracted to organizations where they will fit in. In other words, different job applicants will find different cultures to be attractive. Someone who has a competitive nature may feel comfortable and prefer to work in a company where interpersonal competition is the norm. Others may prefer to work in a team-oriented workplace. Research shows that employees with different personality traits find different cultures attractive. For example, out of the Big Five personality traits, employees who demonstrate neurotic personalities were less likely to be attracted to innovative cultures, whereas those who had openness to experience were more likely to be attracted to innovative cultures.Judge, T. A., & Cable, D. M. (1997). Applicant personality, organizational culture, and organization attraction. Personnel Psychology, 50, 359–394. As a result, individuals will self-select the companies they work for and may stay away from companies that have core values that are radically different from their own. Of course this process is imperfect, and value similarity is only one reason a candidate might be attracted to a company. There may be other, more powerful attractions such as good benefits. For example, candidates who are potential misfits may still be attracted to Google because of the cool perks associated with being a Google employee. At this point in the process, the second component of the ASA framework prevents them from getting in: Selection. Just as candidates are looking for places where they will fit in, companies are also looking for people who will fit into their current corporate culture. Many companies are hiring people for fit with their culture, as opposed to fit with a certain job. For example, Southwest Airlines prides itself for hiring employees based on personality and attitude rather than specific job-related skills, which are learned after being hired. This is important for job applicants to know, because in addition to highlighting your job-relevant skills, you will need to discuss why your personality and values match those of the company. Companies use different techniques to weed out candidates who do not fit with corporate values. For example, Google relies on multiple interviews with future peers. By introducing the candidate to several future coworkers and learning what these coworkers think of the candidate, it becomes easier to assess the level of fit. The Container Store Inc. ensures culture fit by hiring among their customers.Arnold, J. T. (2007, April). Customers as employees. HR Magazine, 77–82. This way, they can make sure that job candidates are already interested in organizing their lives and understand the company’s commitment to helping customers organize theirs. Companies may also use employee referrals in their recruitment process. By using their current employees as a source of future employees, companies may make sure that the newly hired employees go through a screening process to avoid potential person-culture mismatch. Even after a company selects people for person-organization fit, there may be new employees who do not fit in. Some candidates may be skillful in impressing recruiters and signal high levels of culture fit even though they do not necessarily share the company’s values. Moreover, recruiters may suffer from perceptual biases and hire some candidates thinking that they fit with the culture even though the actual fit is low. In any event, the organization is going to eventually eliminate candidates who do not fit in through attrition. Attrition refers to the natural process in which the candidates who do not fit in will leave the company. Research indicates that person-organization misfit is one of the important reasons for employee turnover.Kristof-Brown, A. L., Zimmerman, R. D., & Johnson, E. C. (2005). Consequences of individuals’ fit at work: A meta-analysis of person-job, person-organization, person-group, and person-supervisor fit. Personnel Psychology, 58, 281–342; O’Reilly, III, C. A., Chatman, J. A., & Caldwell, D. F. (1991). People and organizational culture: A profile comparison approach to assessing person-organization fit. Academy of Management Journal, 34, 487–516. Texas Instruments Inc. includes a Workplace and Values Check on its Web page for potential applicants to see if they fit Texas Instrument’s culture. As a result of the ASA process, the company attracts, selects, and retains people who share its core values. On the other hand, those people who are different in core values will be excluded from the organization either during the hiring process or later on through naturally occurring turnover. Thus, organizational culture will act as a self-defending organism where intrusive elements are kept out. Supporting the existence of such self-protective mechanisms, research shows that organizations demonstrate a certain level of homogeneity regarding personalities and values of organizational members.Giberson, T. R., Resick, C. J., & Dickson, M. W. (2005). Embedding leader characteristics: An examination of homogeneity of personality and values in organizations. Journal of Applied Psychology, 90, 1002–1010. Another way in which an organization’s values, norms, and behavioral patterns are transmitted to employees is through onboardingThe process through which new employees learn the attitudes, knowledge, skills, and behaviors required to function effectively within an organization. (also referred to as the organizational socialization process). Onboarding refers to the process through which new employees learn the attitudes, knowledge, skills, and behaviors required to function effectively within an organization. If an organization can successfully socialize new employees into becoming organizational insiders, new employees feel confident regarding their ability to perform, sense that they will feel accepted by their peers, and understand and share the assumptions, norms, and values that are part of the organization’s culture. This understanding and confidence in turn translate into more effective new employees who perform better and have higher job satisfaction, stronger organizational commitment, and longer tenure within the company.Bauer, T. N., Bodner, T., Erdogan, B., Truxillo, D. M., & Tucker, J. S. (2007). Newcomer adjustment during organizational socialization: A meta-analytic review of antecedents, outcomes, and methods. Journal of Applied Psychology, 92, 707–721. There are many factors that play a role in the successful adjustment of new employees. New employees can engage in several activities to help increase their own chances of success at a new organization. Organizations also engage in different activities, such as implementing orientation programs or matching new employees with mentors, which may facilitate onboarding. New employees who are proactive, seek feedback, and build strong relationships tend to be more successful than those who do not.Bauer, T. N., & Green, S. G. (1998). Testing the combined effects of newcomer information seeking and manager behavior on socialization. Journal of Applied Psychology, 83, 72–83; Kammeyer-Mueller, J. D., & Wanberg, C. R. (2003). Unwrapping the organizational entry process: Disentangling multiple antecedents and their pathways to adjustment. Journal of Applied Psychology, 88, 779–794; Wanberg, C. R., & Kammeyer-Mueller, J. D. (2000). Predictors and outcomes of proactivity in the socialization process. Journal of Applied Psychology, 85, 373–385. for example, feedback seeking helps new employees. Especially on a first job, a new employee can make mistakes or gaffes and may find it hard to understand and interpret the ambiguous reactions of coworkers. New hires may not know whether they are performing up to standards, whether it was a good idea to mention a company mistake in front of a client, or why other employees are asking if they were sick over the weekend because of not responding to work-related e-mails. By actively seeking feedback, new employees may find out sooner rather than later any behaviors that need to be changed and gain a better understanding of whether their behavior fits with the company culture and expectations. Several studies show the benefits of feedback seeking for new employee adjustment. Relationship building, or networking, is another important behavior new employees may demonstrate. Particularly when a company does not have a systematic approach to onboarding, it becomes more important for new employees to facilitate their own onboarding by actively building relationships. According to one estimate, 35% of managers who start a new job fail in the new job and either voluntarily leave or are fired within 1.5 years. Of these, over 60% report not being able to form effective relationships with colleagues as the primary reason for their failure.Fisher, A. (2005, March 7). Starting a new job? Don’t blow it. Fortune, 151, 48. New employees may take an active role in building relations by seeking opportunities to have a conversation with their new colleagues, arranging lunches or coffee with them, participating in company functions, and making the effort to build a relationship with their new supervisor.Kim, T., Cable, D. M., & Kim, S. (2005). Socialization tactics, employee proactivity, and person-organization fit. Journal of Applied Psychology, 90, 232–241. OB Toolbox: You’ve Got a New Job! Now How Do You Get on Board? Gather information. Try to find as much about the company and the job as you can before your first day. After you start working, be a good observer, gather information, and read as much as you can to understand your job and the company. Examine how people are interacting, how they dress, and how they act to avoid behaviors that might indicate to others that you are a misfit. Manage your first impression. First impressions may endure, so make sure that you dress appropriately, are friendly, and communicate your excitement to be a part of the team. Be on your best behavior! Seek feedback. Ask your manager or coworkers how well you are doing and whether you are meeting expectations. Listen to what they are telling you and also listen to what they are not saying. Then, make sure to act upon any suggestions for improvement. Be aware that after seeking feedback, you may create a negative impression if you consistently ignore the feedback you receive. Show success early on. In order to gain the trust of your new manager and colleagues, you may want to establish a history of success early. Volunteer for high-profile projects where you will be able to demonstrate your skills. Alternatively, volunteer for projects that may serve as learning opportunities or that may put you in touch with the key people in the company. Sources: Adapted from ideas in Couzins, M., & Beagrie, S. (2005, March 1). How to…survive the first six months of a new job. Personnel Today, 27; Wahlgreen, E. (2002, December 5). Getting up to speed at a new job. Business Week Online. Retrieved January 29, 2009, from http://www.businessweek.com/careers/content/dec2002/ca2002123_2774.htm. Many organizations, including Microsoft, Kellogg Company, and Bank of America, take a more structured and systematic approach to new employee onboarding, while others follow a “sink or swim” approach in which new employees struggle to figure out what is expected of them and what the norms are. A formal orientation programProgram that indoctrinates new employees to the company culture, and introduces them to their new jobs and colleagues. indoctrinates new employees to the company culture, as well as introduces them to their new jobs and colleagues. An orientation program is important, because it has a role in making new employees feel welcome in addition to imparting information that may help new employees be successful on their new jobs. Many large organizations have formal orientation programs consisting of lectures, videotapes, and written material, while some may follow more unusual approaches. According to one estimate, most orientations last anywhere from one to five days, and some companies are currently switching to a computer-based orientation. Ritz-Carlton, the company ranked number 1 in Training magazine’s 2007 top 125 list, uses a very systematic approach to employee orientation and views orientation as the key to retention. In the two-day classroom orientation, employees spend time with management, dine in the hotel’s finest restaurant, and witness the attention to customer service detail firsthand. For example, they receive hand-written welcome notes and their favorite snacks during the break. During these two days, they are introduced to the company’s intensive service standards, team orientation, and its own language. Later, on their 21st day, they are tested on the company’s service standards and are certified.Durett, J. (2006, March 1). Technology opens the door to success at Ritz-Carlton. Retrieved January 28, 2009, from http://www.managesmarter.com/msg/search/article_display.jsp?vnu_content_id=1002157749; Elswick, J. (2000, February). Puttin’ on the Ritz: Hotel chain touts training to benefit its recruiting and retention. Employee Benefit News, 14, 9; The Ritz-Carlton Company: How it became a “legend” in service. (2001, Jan–Feb). Corporate University Review, 9, 16. Research shows that formal orientation programs are helpful in teaching employees about the goals and history of the company, as well as communicating the power structure. Moreover, these programs may also help with a new employee’s integration into the team. However, these benefits may not be realized to the same extent in computer-based orientations. In fact, compared to those taking part in a regular, face-to-face orientation, individuals undergoing a computer-based orientation were shown to have lower understanding of their job and the company, indicating that different formats of orientations may not substitute for each other.Klein, H. J., & Weaver, N. A. (2000). The effectiveness of an organizational level orientation training program in the socialization of new employees. Personnel Psychology, 53, 47–66; Moscato, D. (2005, April). Using technology to get employees on board. HR Magazine, 50, 107–109; Wesson, M. J., & Gogus, C. I. (2005). Shaking hands with a computer: An examination of two methods of organizational newcomer orientation. Journal of Applied Psychology, 90, 1018–1026. One of the most important ways in which organizations can help new employees adjust to a company and a new job is through organizational insiders—namely supervisors, coworkers, and mentors. Research shows that leaders have a key influence over onboarding, and the information and support leaders provide determine how quickly employees learn about the company politics and culture. Coworker influence determines the degree to which employees adjust to their teams. MentorsTrusted people who provide employees with advice and support regarding career-related matters. can be crucial to helping new employees adjust by teaching them the ins and outs of their jobs and how the company really operates. A mentor is a trusted person who provides an employee with advice and support regarding career-related matters. Although a mentor can be any employee or manager who has insights that are valuable to the new employee, mentors tend to be relatively more experienced than their protégés. Mentoring can occur naturally between two interested individuals, or organizations can facilitate this process by having formal mentoring programs. These programs may successfully bring together mentors and protégés who would not come together otherwise. Research indicates that the existence of these programs does not guarantee their success, and there are certain program characteristics that may make these programs more effective. For example, when mentors and protégés feel that they had input in the mentor-protégé matching process, they tend to be more satisfied with the arrangement. Moreover, when mentors receive training beforehand, the outcomes of the program tend to be more positive.Allen, T. D., Eby, L. T., & Lentz, E. (2006). Mentorship behaviors and mentorship quality associated with formal mentoring programs: Closing the gap between research and practice. Journal of Applied Psychology, 91, 567–578. Because mentors may help new employees interpret and understand the company’s culture, organizations may benefit from selecting mentors who personify the company’s values. Thus, organizations may need to design these programs carefully to increase their chance of success. Leaders are instrumental in creating and changing an organization’s culture. There is a direct correspondence between a leader’s style and an organization’s culture. For example, when leaders motivate employees through inspiration, corporate culture tends to be more supportive and people oriented. When leaders motivate by making rewards contingent on performance, the corporate culture tends to be more performance oriented and competitive.Sarros, J. C., Gray, J., & Densten, I. L. (2002). Leadership and its impact on organizational culture. International Journal of Business Studies, 10, 1–26. In these and many other ways, what leaders do directly influences the cultures their organizations have. Part of the leader’s influence over culture is through role modeling. Many studies have suggested that leader behavior, the consistency between organizational policy and leader actions, and leader role modeling determine the degree to which the organization’s culture emphasizes ethics.Driscoll, K., & McKee, M. (2007). Restorying a culture of ethical and spiritual values: A role for leader storytelling. Journal of Business Ethics, 73, 205–217. The leader’s own behaviors will signal to employees what is acceptable behavior and what is unacceptable. In an organization in which high-level managers make the effort to involve others in decision making and seek opinions of others, a team-oriented culture is more likely to evolve. By acting as role models, leaders send signals to the organization about the norms and values that are expected to guide the actions of organizational members. Leaders also shape culture by their reactions to the actions of others around them. For example, do they praise a job well done, or do they praise a favored employee regardless of what was accomplished? How do they react when someone admits to making an honest mistake? What are their priorities? In meetings, what types of questions do they ask? Do they want to know what caused accidents so that they can be prevented, or do they seem more concerned about how much money was lost as a result of an accident? Do they seem outraged when an employee is disrespectful to a coworker, or does their reaction depend on whether they like the harasser? Through their day-to-day actions, leaders shape and maintain an organization’s culture. Finally, the company culture is shaped by the type of reward systems used in the organization, and the kinds of behaviors and outcomes it chooses to reward and punish. One relevant element of the reward system is whether the organization rewards behaviors or results. Some companies have reward systems that emphasize intangible elements of performance as well as more easily observable metrics. In these companies, supervisors and peers may evaluate an employee’s performance by assessing the person’s behaviors as well as the results. In such companies, we may expect a culture that is relatively people or team oriented, and employees act as part of a family.Kerr, J., & Slocum, J. W., Jr. (2005). 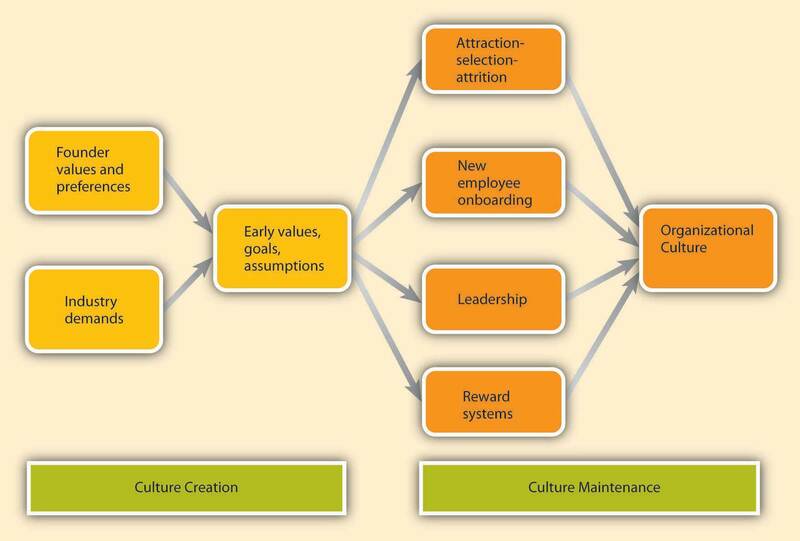 Managing corporate culture through reward systems. Academy of Management Executive, 19, 130–138. On the other hand, in companies that purely reward goal achievement, there is a focus on measuring only the results without much regard to the process. In these companies, we might observe outcome-oriented and competitive cultures. Another categorization of reward systems might be whether the organization uses rankings or ratings. In a company where the reward system pits members against one another, where employees are ranked against each other and the lower performers receive long-term or short-term punishments, it would be hard to develop a culture of people orientation and may lead to a competitive culture. On the other hand, evaluation systems that reward employee behavior by comparing them to absolute standards as opposed to comparing employees to each other may pave the way to a team-oriented culture. Whether the organization rewards performance or seniority would also make a difference in culture. When promotions are based on seniority, it would be difficult to establish a culture of outcome orientation. Finally, the types of behaviors that are rewarded or ignored set the tone for the culture. Service-oriented cultures reward, recognize, and publicize exceptional service on the part of their employees. In safety cultures, safety metrics are emphasized and the organization is proud of its low accident ratings. What behaviors are rewarded, which ones are punished, and which are ignored will determine how a company’s culture evolves. Written down. If your organization does not have a formal plan, write one yourself. It may not make sense to share it with others, but at least you will have a roadmap. If your organization does have one, refer to it on a monthly basis. Participatory. The power of onboarding programs is in the interaction. Try to get participation from others to the extent possible and engage in onboarding activities offered to you by the organization. Tracked over time. Keep in mind that research shows onboarding has a rhythm of 30-, 60-, 90-, and 180-day milestones. Be sure to track your progress. Clear on objectives, timeline, roles, and responsibilities. This will help ensure that role conflict and ambiguity doesn’t detour your onboarding process. hearing about potential problems and critical advice to help you be successful. Be sure to include a list of your key questions and things you need to help you do your job better. Source: Adapted from Bauer, T. N., & Elder, E. (2006). Onboarding newcomers into an organization. 58th Annual Society for Human Resource Management (SHRM) Conference & Exposition. Washington, DC. A mission statementA statement of purpose, describing who the company is and what it does. is a statement of purpose, describing who the company is and what it does. Many companies have mission statements, but they do not always reflect the company’s values and its purpose. An effective mission statement is well known by employees, is transmitted to all employees starting from their first day at work, and influences employee behavior. Not all mission statements are effective, because some are written by public relations specialists and can be found in a company’s Web site, but it does not affect how employees act or behave. In fact, some mission statements reflect who the company wants to be as opposed to who they actually are. If the mission statement does not affect employee behavior on a day-to-day basis, it has little usefulness as a tool for understanding the company’s culture. An oft-cited example of a mission statement that had little impact on how a company operates belongs to Enron. Their missions and values statement began, “As a partner in the communities in which we operate, Enron believes it has a responsibility to conduct itself according to certain basic principles.” Their values statement included such ironic declarations as “We do not tolerate abusive or disrespectful treatment. Ruthlessness, callousness and arrogance don’t belong here.”Kunen, J. S. (2002, January 19). Enron’s vision (and values) thing. The New York Times, p. 19. A mission statement that is taken seriously and widely communicated may provide insights into the corporate culture. For example, the Mayo Clinic’s mission statement is “The needs of the patient come first.” This mission statement evolved from the founders who are quoted as saying, “The best interest of the patient is the only interest to be considered.” Mayo Clinics have a corporate culture that puts patients first. For example, no incentives are given to physicians based on the number of patients they see. Because doctors are salaried, they have no interest in retaining a patient for themselves and they refer the patient to other doctors when needed.Jarnagin, C., & Slocum, J. W., Jr. (2007). Creating corporate cultures through mythopoetic leadership. Organizational Dynamics, 36, 288–302. Wal-Mart Stores Inc. may be another example of a company who lives its mission statement, and therefore its mission statement may give hints about its culture: “Saving people money so they can live better.”Wal-Mart Stores Inc. (2008). Investor frequently asked questions. Retrieved November 20, 2008, from http://walmartstores.com/Investors/7614.aspx. 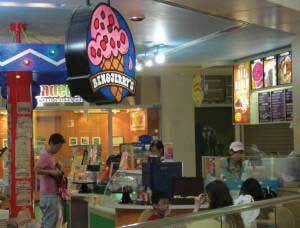 In fact, their culture emphasizes thrift and cost control in everything they do. For example, even though most CEOs of large companies in the United States have lavish salaries and showy offices, Wal-Mart’s CEO Michael Duke and other high-level corporate officers work out of modest offices in the company’s headquarters. Tradition is important at Wal-Mart. 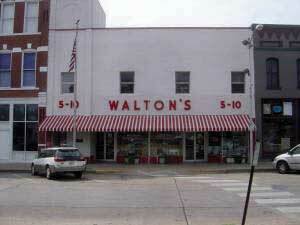 Sam Walton’s original Walton’s Five and Dime is now the Wal-Mart Visitor’s Center in Bentonville, Arkansas. RitualsRepetitive activities within an organization that have symbolic meaning. refer to repetitive activities within an organization that have symbolic meaning.Anand, N. (2005). Blackwell encyclopedic dictionary of organizational behavior. Cambridge: Wiley. Usually rituals have their roots in the history of a company’s culture. They create camaraderie and a sense of belonging among employees. They also serve to teach employees corporate values and create identification with the organization. For example, at the cosmetics firm Mary Kay Inc., employees attend award ceremonies recognizing their top salespeople with an award of a new car—traditionally a pink Cadillac. These ceremonies are conducted in large auditoriums where participants wear elaborate evening gowns and sing company songs that create emotional excitement. During this ritual, employees feel a connection to the company culture and its values, such as self-determination, will power, and enthusiasm.Jarnagin, C., & Slocum, J. W., Jr. (2007). Creating corporate cultures through mythopoetic leadership. Organizational Dynamics, 36, 288–302. Another example of rituals is the Saturday morning meetings of Wal-Mart. This ritual was first created by the company founder Sam Walton, who used these meetings to discuss which products and practices were doing well and which required adjustment. He was able to use this information to make changes in Wal-Mart’s stores before the start of the week, which gave him a competitive advantage over rival stores who would make their adjustments based on weekly sales figures during the middle of the following week. Today, hundreds of Wal-Mart associates attend the Saturday morning meetings in the Bentonville, Arkansas, headquarters. The meetings, which run from 7:00 to 9:30 a.m., start and end with the Wal-Mart cheer; the agenda includes a discussion of weekly sales figures and merchandising tactics. As a ritual, the meetings help maintain a small-company atmosphere, ensure employee involvement and accountability, communicate a performance orientation, and demonstrate taking quick action.Schlender, B. (2005, April 18). Wal-Mart’s $288 billion meeting. Fortune, 151, 90–106; Wal around the world. (2001, December 8). Economist, 361, 55–57. Another way in which an observer may find out about a company’s culture is to examine its rules and policies. Companies create rules to determine acceptable and unacceptable behavior, and thus the rules that exist in a company will signal the type of values it has. Policies about issues such as decision making, human resources, and employee privacy reveal what the company values and emphasizes. For example, a company that has a policy such as “all pricing decisions of merchandise will be made at corporate headquarters” is likely to have a centralized culture that is hierarchical, as opposed to decentralized and empowering. Similarly, a company that extends benefits to both part-time and full-time employees, as well as to spouses and domestic partners, signals to employees and observers that it cares about its employees and shows concern for their well-being. By offering employees flexible work hours, sabbaticals, and telecommuting opportunities, a company may communicate its emphasis on work-life balance. The presence or absence of policies on sensitive issues such as English-only rules, bullying or unfair treatment of others, workplace surveillance, open-door policies, sexual harassment, workplace romances, and corporate social responsibility all provide pieces of the puzzle that make up a company’s culture. A company’s building, including the layout of employee offices and other work spaces, communicates important messages about a company’s culture. The building architecture may indicate the core values of an organization’s culture. For example, visitors walking into the Nike Inc. campus in Beaverton, Oregon, can witness firsthand some of the distinguishing characteristics of the company’s culture. The campus is set on 74 acres and boasts an artificial lake, walking trails, soccer fields, and cutting-edge fitness centers. The campus functions as a symbol of Nike’s values such as energy, physical fitness, an emphasis on quality, and a competitive orientation. In addition, at fitness centers on the Nike headquarters, only those wearing Nike shoes and apparel are allowed in. This sends a strong signal that loyalty is expected. The company’s devotion to athletes and their winning spirits is manifested in campus buildings named after famous athletes, photos of athletes hanging on the walls, and honorary statues dotting the campus.Capowski, G. S. (1993, June). Designing a corporate identity. Management Review, 82, 37–41; Collins, J., & Porras, J. I. (1996). Building your company’s vision. Harvard Business Review, 74, 65–77; Labich, K., & Carvell, T. (1995, September 18). Nike vs. Reebok. Fortune, 132, 90–114; Mitchell, C. (2002). Selling the brand inside. Harvard Business Review, 80, 99–105. A very different tone awaits visitors to Wal-Mart headquarters, where managers have gray and windowless offices.Berner, R. (2007, February 12). My Year at Wal-Mart. Business Week, 4021, 70–74. By putting its managers in small offices and avoiding outward signs of flashiness, Wal-Mart does a good job of highlighting its values of economy. The layout of the office space also is a strong indicator of a company’s culture. A company that has an open layout where high-level managers interact with employees may have a culture of team orientation and egalitarianism, whereas a company where high-level managers have their own floor may indicate a higher level of hierarchy. Microsoft employees tend to have offices with walls and a door, because the culture emphasizes solitude, concentration, and privacy. In contrast, Intel Corporation is famous for its standard cubicles, which reflect its culture of equality. The same value can also be observed in its avoidance of private and reserved parking spots.Clark, D. (2007, October 15). Why Silicon Valley is rethinking the cubicle office. Wall Street Journal, 250, p. B9. The degree to which playfulness, humor, and fun is part of a company’s culture may be indicated in the office environment. For example, Jive Software boasts a colorful, modern, and comfortable office design. Their break room is equipped with a keg of beer, free snacks and sodas, an XBOX 360, and Nintendo Wii. A casual observation of their work environment sends the message that employees who work there see their work as fun.Jive Software. (2008). Careers. Retrieved November 20, 2008, from http://www.jivesoftware.com/company. Perhaps the most colorful and effective way in which organizations communicate their culture to new employees and organizational members is through the skillful use of stories. A story can highlight a critical event an organization faced and the collective response to it, or can emphasize a heroic effort of a single employee illustrating the company’s values. The stories usually engage employee emotions and generate employee identification with the company or the heroes of the tale. A compelling story may be a key mechanism through which managers motivate employees by giving their behavior direction and energizing them toward a certain goal.Beslin, R. (2007). Story building: A new tool for engaging employees in setting direction. Ivey Business Journal, 71, 1–8. Moreover, stories shared with new employees communicate the company’s history, its values and priorities, and serve the purpose of creating a bond between the new employee and the organization. For example, you may already be familiar with the story of how a scientist at 3M invented Post-it notes. Arthur Fry, a 3M scientist, was using slips of paper to mark the pages of hymns in his church choir, but they kept falling off. He remembered a super-weak adhesive that had been invented in 3M’s labs, and he coated the markers with this adhesive. Thus, the Post-it notes were born. However, marketing surveys for the interest in such a product were weak, and the distributors were not convinced that it had a market. Instead of giving up, Fry distributed samples of the small yellow sticky notes to secretaries throughout his company. Once they tried them, people loved them and asked for more. Word spread, and this led to the ultimate success of the product. As you can see, this story does a great job of describing the core values of a 3M employee: Being innovative by finding unexpected uses for objects, persevering, and being proactive in the face of negative feedback.Higgins, J. M., & McAllester, C. (2002). Want innovation? Then use cultural artifacts that support it. Organizational Dynamics, 31, 74–84. OB Toolbox: As a Job Candidate, How Would You Find Out If You Are a Good Fit? Do your research. Talking to friends and family members who are familiar with the company, doing an online search for news articles about the company, browsing the company’s Web site, and reading their mission statement would be a good start. Observe the physical environment. Do people work in cubicles or in offices? What is the dress code? What is the building structure? Do employees look happy, tired, or stressed? The answers to these questions are all pieces of the puzzle. Read between the lines. For example, the absence of a lengthy employee handbook or detailed procedures might mean that the company is more flexible and less bureaucratic. How are you treated? The recruitment process is your first connection to the company. Were you treated with respect? Do they maintain contact with you, or are you being ignored for long stretches at a time? Ask questions. What happened to the previous incumbent of this job? What does it take to be successful in this firm? What would their ideal candidate for the job look like? The answers to these questions will reveal a lot about the way they do business. Listen to your gut. Your feelings about the place in general, and your future manager and coworkers in particular, are important signs that you should not ignore. Sources: Adapted from ideas in Daniel, L., & Brandon, C. (2006). Finding the right job fit. HR Magazine, 51, 62–67; Sacks, D. (2005). Cracking your next company’s culture. Fast Company, 99, 85–87. Organization cultures are created by a variety of factors, including founders’ values and preferences, industry demands, and early values, goals, and assumptions. Culture is maintained through attraction-selection-attrition, new employee onboarding, leadership, and organizational reward systems. 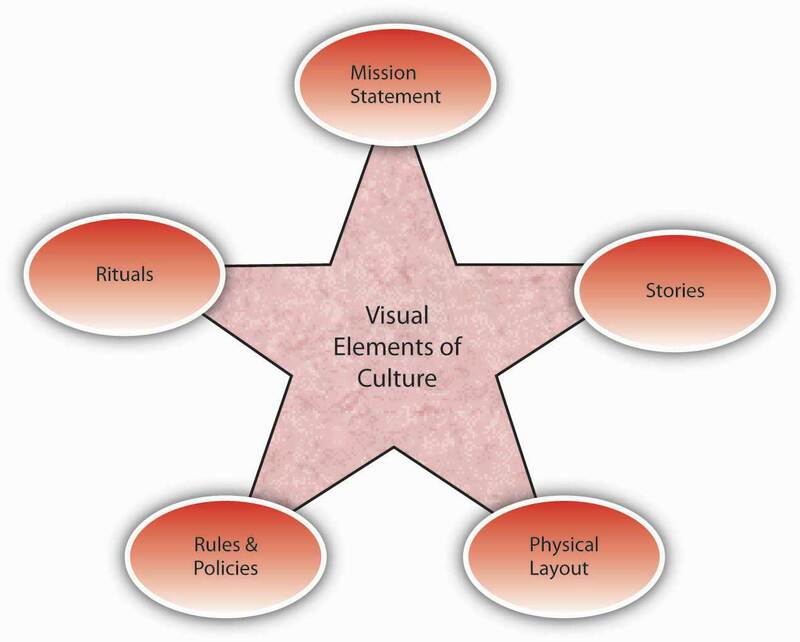 Signs of a company’s culture include the organization’s mission statement, stories, physical layout, rules and policies, and rituals. What type of a company do you feel would be a good fit for you? What type of a culture would be a misfit for you? In your past work experience, were there any moments when you felt that you did not fit with the organization? Why? What is the role of physical layout as an indicator of company culture? What type of a physical layout would you expect from a company that is people oriented? Team oriented? Stable?